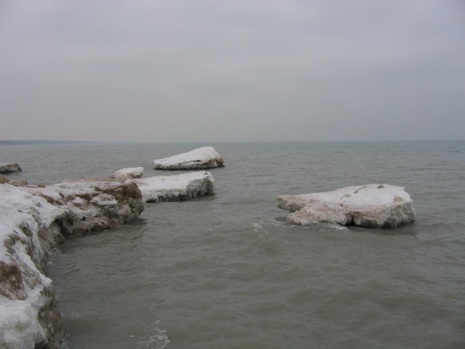 In the depths of winter, one can easily imagine he is standing on the shore of some remote polar sea when in reality the backdrop is Chicago’s famous skyline. 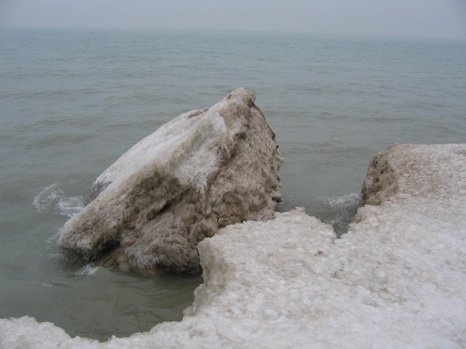 Cold, mid-winter temperatures bring an abundance of fascinating natural ice sculptures to Lake Michigan’s shoreline. 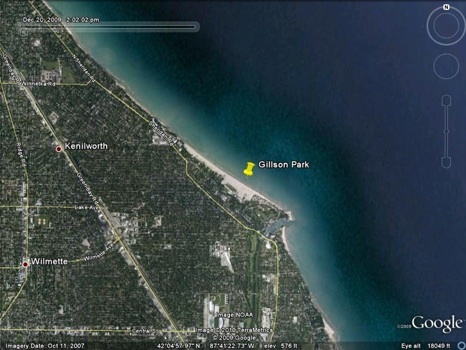 Although this fantastic but short-lived landscape can be seen in many places along the shore, my favorite location is the long stretch of open beach in Wilmette’s Gillson Park. 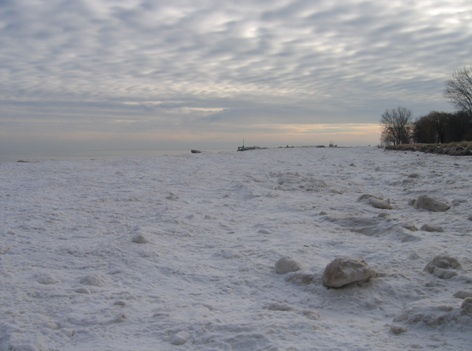 Shore ice is particularly well developed here, perhaps due to the northwest-southeast orientation of the lakeshore, exposing the beach to the full fury of large waves driven by north and northeast winds down the long fetch of the lake. Shore-fast ice grows from the shore into the water as winter progresses. In the picture below, three distinct bands can be seen. Each band in this picture (taken 1/15/10) varies in width between 50 and 100 feet. The first band to form is white one to the right below the trees and along the sandy beach. It formed as waves broke onto the shore and gradually built up layer upon layer of ice in the cold air we experienced in late December. The middle band formed next and runs into the distance down the middle of the photograph. It looks darker because it formed from chunks of floating ice that got covered with sand as they sloshed around in the surf before they froze into place. The third band on the left is currently forming as waves break against the ice front. The picture below shows this actively forming ice front. I estimate the height of the ice in this picture to reach about 12 feet above lake level but in some places it is even higher. Note the wave crashing into the ice front. In this case, the lake water is unfrozen so some of it freezes on contact with the shore ice and forms a rounded slippery surface. 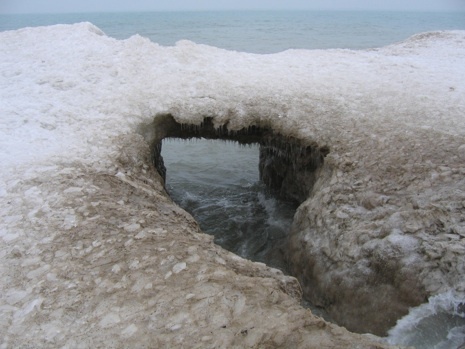 In the case pictured below, the lake was freezing in thin sheets which were tossed on to the shore-ice shelf by wave action. The terrain here can be likened to countless broken plate-glass windows scattered about. The scene below shows details of the middle band where wave action brought in chunks of sandy ice/snow chunks ranging in size from golf balls to basketballs. Ice caves form at many points along the ice front. This one is probably about 20 feet deep with a ceiling about 15 feet above lake level. The roof of this ice cave probably collapsed to leave a remnant ice bridge. In some case, waves create an ice- and sand-encrusted cone or ice volcano as waves freeze on edge the growing ice shelf. This one rises about 15 feet above the ice which is in turn about 10 feet above lake level. The lake was relatively calm today so this one was inactive. 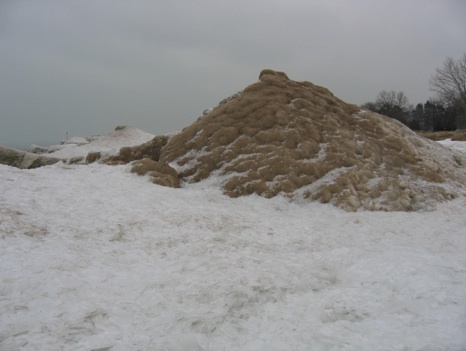 However, I visited the lakefront last year on a cold day with a NE wind whipping up large waves and saw one of these ice volcanoes actively erupting. I could see a wave approaching, hear it thunder through the ice cave below, burst out in a fountain of spray, only to freeze on contact with the growing ice cone. Check out this video of how an ice-cano forms and this article on their dynamics along the south shore of Lake Superior. Of course, this environment is very unstable. Here an ice chunk the size of my living room has broken off and fallen into the lake. The once horizontal layers present in the broken-off piece when it formed can now be seen reposing at nearly a 45 degree angle. So, while I encourage everyone to get out and enjoy this taste of the Arctic in Chicago, venturing out onto the ice is never safe. 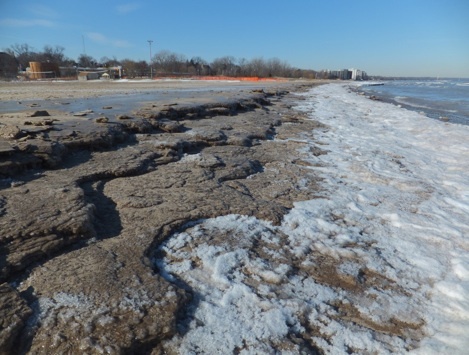 These terraces at the Wilmette swimming beach step down to the first significant shore ice of the season. Light rain the day before saturated the sand at above freezing temperatures which dropped to 11⁰F by 7:00 AM this morning. 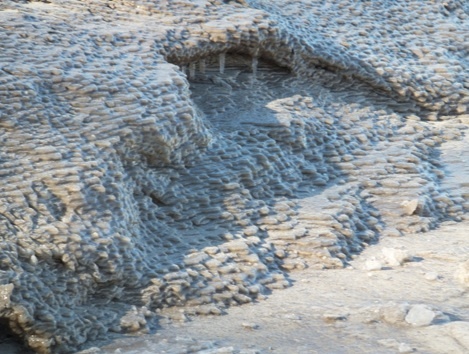 Before the ice along the shore formed, wave action eroded the frozen layers of saturated sand to form the terraces. 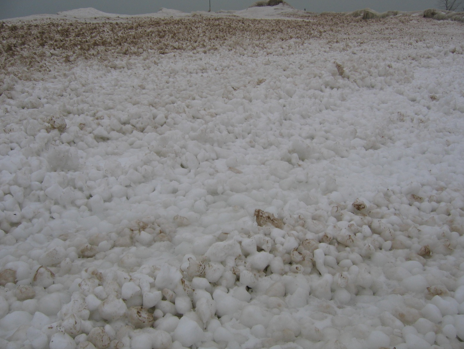 Slabs of frozen sand were broken off and tossed onto the beach above the terraces. Zooming in on the edge of one of these terraces reveals that they actually are comprised of many layers of frozen sand, each less than an inch tall. 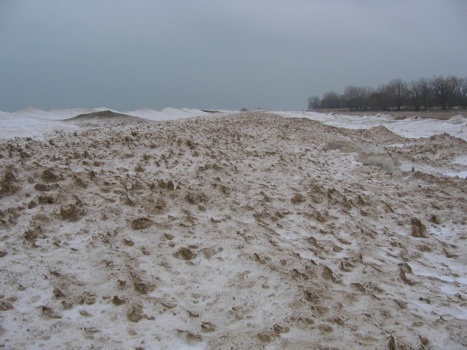 In my 35 years of observing the formation of ice features along the Lake Michigan shore in the vicinity, this is the latest date of the first accumulation of ice shelves that I can remember. 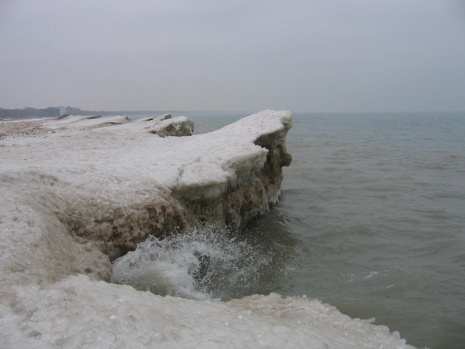 The view below, taken on January 18th of 2012, shows the first shore ice of the season. It is only tens of feet wide. 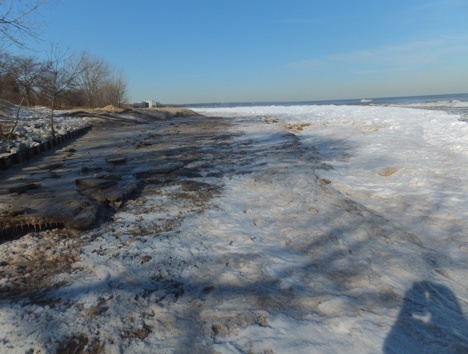 Compare that to this photo taken looking southeast (the opposite direction) at the same shoreline a year ago on December 19, 2010. Last year by the middle of December the shore ice shelf was several hundred feet wide. This a really nice set of photos; thank you. I found your website during a search for “Basketball Ice”. I was surprised to see it also formed on the West side of the lake. Does this happen every year, or only this time? I spent 20 years at Cook Nuclear Plant over in Bridgman, Michigan, and my cronies and I always were on the watch for the day we might see the big sandy ice balls floating and bouncing on the shore line. More often than not it seemed, we’d miss seeing the balls in the dark of night, and have to wait another year. Have you ever seen the quite-tall formations on the other side of the lake formed by wind-driven splashes? Pretty impressive, but sadly too many people – mostly kids are lured offshore to walk on the ice only to break through and often perish. “Basketball Ice”, “Livingroom Couch Ice”, and “You Name the Size Ice” are quite common on this side of the lake. I have many pictures of a vast size range of ice chunks sloshing in the surf. Often bands within the shore ice seem to be sorted by size depending on the energy in the waves that tossed them onto the shelf ice. I’ve actually seen waves toss “Basketball Ice” onto the shelf but have not managed to photograph it in action. The wind, wave and precipitation conditions are quite etreme when the ice chunks are actuall being deposited in this way. At other times it appears that a cold snap has freezen the ice chunks to the lake edge ice without tossing them onto the ice shelf. The chunks in the bands that form during these cold snap seem unsorted by size. Unfortunately, I didn’t witness any of these phenomenon this past winter due to the mild conditions. But it was still cool by the Lake. Get out there with your camera and post some pictures from your side of the Lake. When I posed my comments, we were living in Santa Barbara, California. It’s a place where it hardly ever snows; maybe only once every 20 to 30 years. 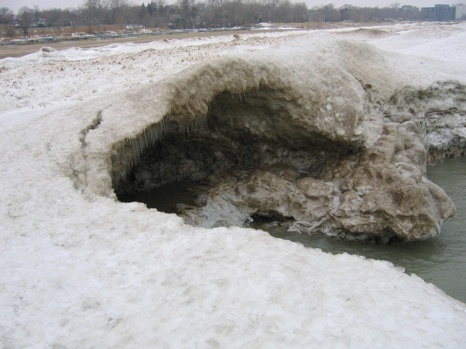 All water piping is exposed when convenient, as freezing is only associated with night-time frost, which never penetrates the earth much-less causes a rupture. 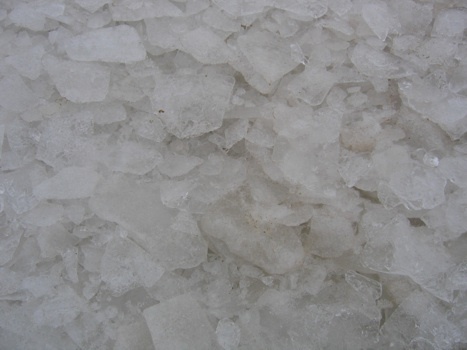 Ice is only found in drinks. But we’re moving back to Michigan in a bit. So I just might take up your offer. Good info, Steve; thank you. I appreciate your response, and it’s pretty interesting that you have documented so much that’s so common it’s almost never documented. I’m kind of embarrassed to say that my wife and I moved to Santa Barbara a few years back, and it’s said it doesn’t snow here – ever! Yes, the water pipes in our house are just mounted to the outside of the siding, as it NEVER freezes either! Hoping to someday return to My Michigan (in warmer months). I walked on Gilson Beach yesterday (May 3rd) and saw heavy machinery moving the sand back onto the beach. I was curious how the sand moved so far inland so I searched for pictures. These were great! Thank you. I especially loved the ice shelves and ice-canoes! Thank you for reading, and commenting!